Most people find it Mondays to be the toughest part of the week. It’s so hard to get back in the swing of things after a long, restful weekend. I personally love Mondays. 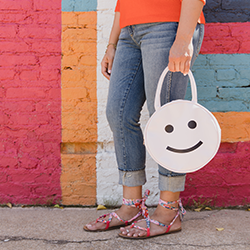 There’s always smiles to transform and ideas to get excited about. 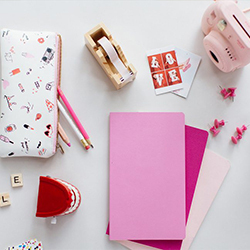 Do you need a little help getting started today? No worries! 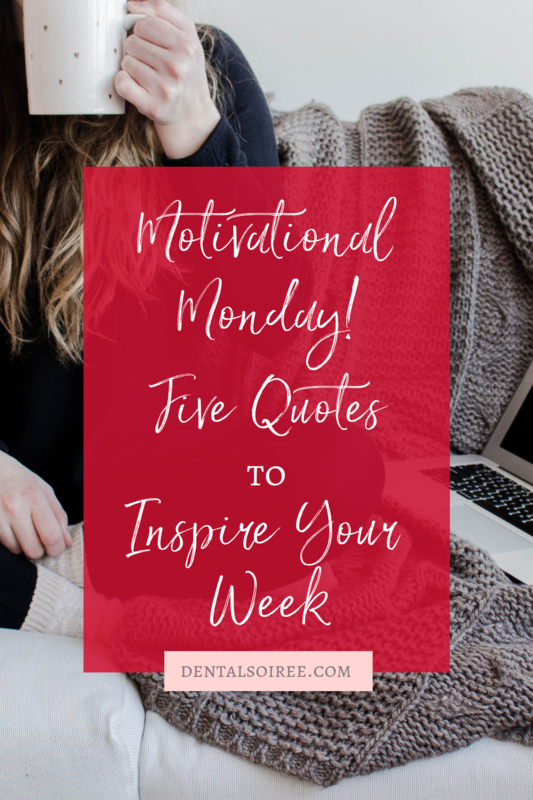 We want to share five of our favorite quotes with you; hopefully they will turn your unmotivated Monday into a motivational Monday. These are the words that get me super excited to start my week and do BIG things! This is a quote by Simon Sinek that I saw recently after a trip to my favorite place in America… Florida! It resonated with me because I had been so stressed before that trip, but after sitting on the beach for a few days, things looked (and felt) different. Sometimes you need a little perspective to sort out ideas or move away from stress. It can seem counter-intuitive to stop working on something when there’s so much to do, but I’ve learned that whitespace is absolutely necessary to grow. I don’t know who originally came up with this quote, but it really speaks to me, and it’s perfect for Motivational Monday. We can get so focused on our goals, it can be easy to forget the bigger picture. The “why” behind what we do. It’s so important to check in with your heart as you do your work. Does your task list align with what fuels your passion? Staying in touch with your values will help motivate you when you don’t feel motivated by the task itself. John Burroughs was a wise man, and this quote is one I live my life by. You can analyze and weigh out every decision until you’re blue in the face, but ultimately, you’re going to have to take a leap. You got into this business to do big things, and as awesome as it would be to be able to just write “do big things” in your planner, it doesn’t work like that. You’re gonna have to leap and have a little faith. Your net will appear and you will be SO glad you pushed yourself to go there. This is another one that I just happened to see and I don’t know who originally said it, but boy does it speak to me. As dentists, I think we can get in our own way a lot because we think, “that dream is too big/different/risky/bold. I should stay in my lane and just focus on doing what I do.” That kind of thinking will truly limit your impact on the world! Stop stopping yourself and instead, see what kinds of amazing things you can do! Do you have any “Motivational Monday” quotes that you love? If you’re anything like me, you’ve got them hanging up at your desk, on your coffee mugs, and all over your Instagram feed. Share a few of your favorites with me in the comments! Let’s inspire each other to accomplish big things this week! Did you buy yourself a new planner for 2019? There’s nothing like the possibilities that hide in those clean pages, the year just waiting for you to take it by storm. 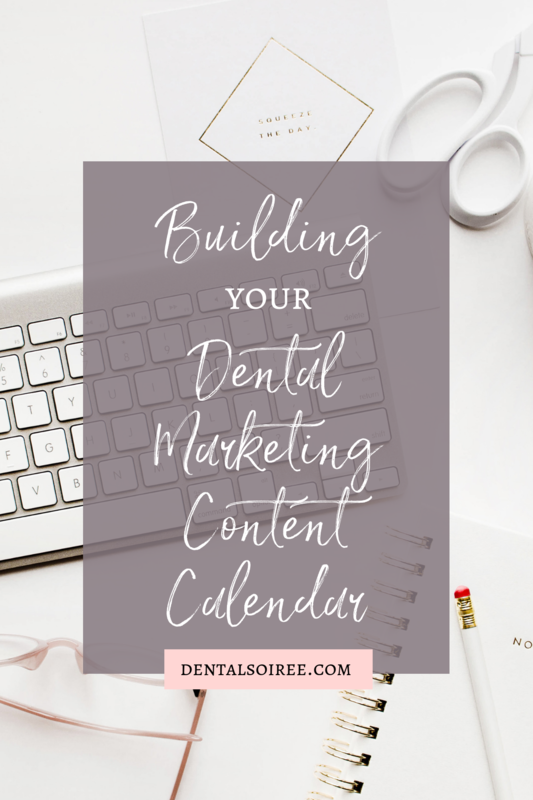 If you’re a person who is naturally drawn to organization, you’d probably really love using a dental marketing content calendar to plan out your social media content for the year! It might seem like a big task to plan everything out in advance, but you don’t have to do the whole year… you can just take it one month at a time. You’ll be amazed at how much more intentional you can be with your marketing. This almost always translates to better results and a more strategic approach. 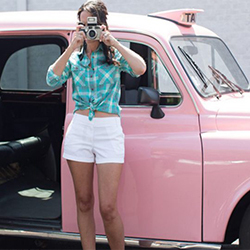 It helps you use social media as a tool rather than just a place you hurriedly upload photos and updates to. What is a Dental Marketing Content Calendar? You’re probably wondering what exactly we mean by a dental marketing content calendar. There are no hard and fast rules about what this has to be. It can be any kind of calendar, planner, or even a spreadsheet that you use to plan out your social media content. First, you’ll want to decide how often you want to post. A lot of dental practices find the most success by posting daily, but if that’s overwhelming for you to start with, consider posting three times a week (maybe Monday, Wednesday, and Friday). Next, take a look at upcoming holidays and special events. Plan content around those things first. Then, think about services you want to highlight. Then, fill in the gaps with educational content, behind the scenes photos, or just some fun, lighthearted posts that will make people want to follow your feed. Once you have everything planned out for the month, you’ll need to actually create the content. You’ll need eye-catching imagery and some great copy to go with it. This is by far the most time-consuming part, and you’ll want to do your best to stay on top of the social media trends that come and go so you can see the biggest return on your efforts. We have some super fun courses that specifically made for dentists over at The Soiree Suite. They will help you get all the information you need quickly so you can start rocking your social media! Also, if you need help with imagery, you might want to check out Soiree Stock. This is our styled stock photography membership site that is loaded with gorgeous images that are ideal for dental practices. All you have to do is download the images you like, write a caption to go with them, and post. We have seasonal and holiday-themed images, dental images, and a whole bunch of other categories that will make setting up your dental marketing content calendar a breeze! Probably the most difficult part of all of this will be staying on track. As a dentist myself, I know how busy life can get and if we’re honest, social media is probably the first thing to get tossed to the side — especially if you’re also raising a family and have a busy schedule outside the office! The dental marketing content calendar will help you streamline your work, but using tools like Planoly or Later to upload content ahead of time and schedule it in advance is a great way to be more hands off with your marketing. Your content will still stream when you want it to, but you won’t have to be there hitting the “post” button every single time. We also think it’s ideal to sit down once a month and batch out all your work for the next month. It might take a few hours, but then you don’t have to think about your social media content again for a whole month! Batch working is honestly the most efficient way to work, and we believe social media is important enough to dedicate a few hours per month to. No Time? You Can Outsource! Does this all seem impossible? 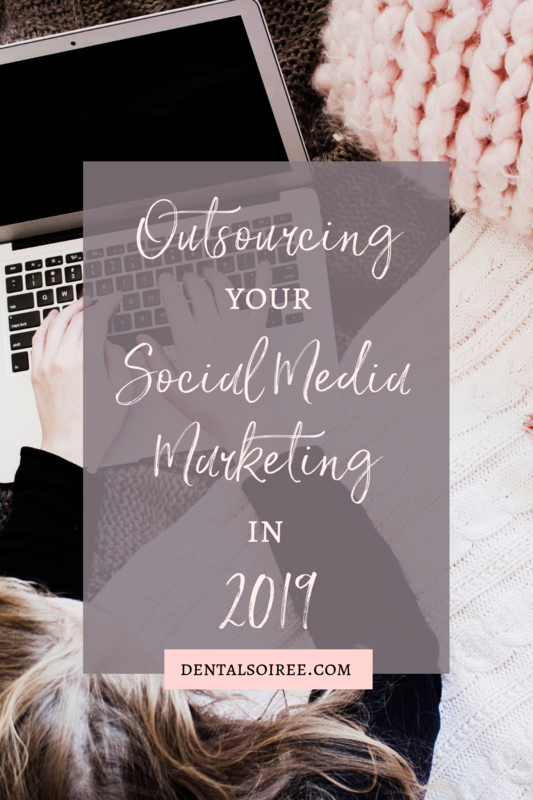 If your schedule simply doesn’t allow for regular social media updates, you can absolutely outsource it! If you decide to go this route, we encourage you to choose someone who understands the dental industry. This will be a major advantage when it comes to turning followers into patients. The Dental Soiree team is experienced when it comes to getting you a gorgeous and effective social media presence that perfectly fits your brand and personality. We have several packages based on the services you need help with the most! You can contact us by filling out this short form and we will be in contact with you shortly to discuss details and answer your questions! If you run a busy dental practice, you probably know that building an online presence is very important for your practice to succeed. However, you probably also know that doing that is far easier said than done. 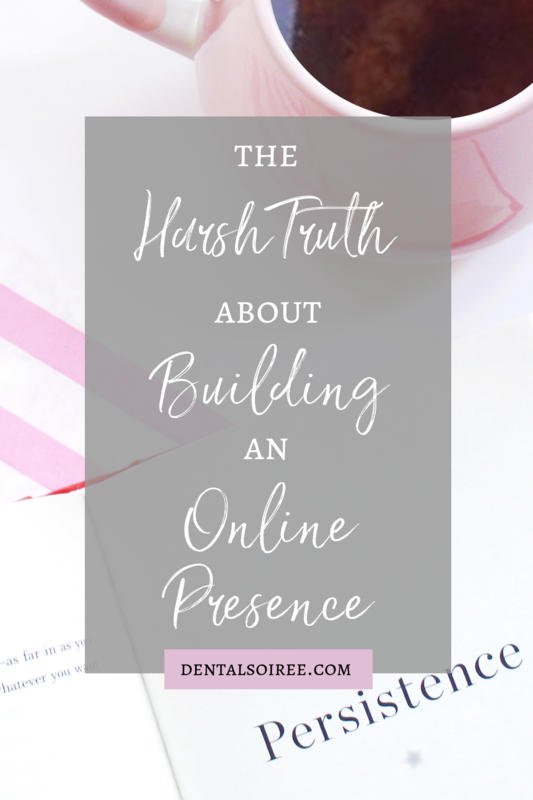 There’s tons of effort, strategy, and planning that go into having a strong presence online, and even after you “achieve” your goals, the work is not over. You have to consistently put in effort to maintain your rankings and follower count. Online marketing success often does not come quickly or easily. Why are we telling you this? Because first of all, we believe it’s important to be honest. A lot of the people reading this blog are dentists. They are not marketing professionals. They likely do not know the inner workings of the various social media platforms. Many people just starting out on social media think that they just need to post content every once in a while and the followers will come. However, it isn’t that easy. Building an online presence is about more than posting photos on Instagram once in a while or posting a reminder to your Facebook followers to book an appointment at your practice. Unfortunately, there are complicated algorithms at play that all but ensure only a tiny portion of your fans are seeing your posts. Hashtags are great, but just like fashion, trends change all the time and the hashtag list you’re still using from last year is probably outdated and ineffective at this point. So how do you succeed online? If you don’t post consistent content on social media (and your blog) and have a strategy in place for doing so, building an online presence is going to be a very tough uphill battle. The only way to “beat” the algorithms is to share enough content that your followers will see it, whether it’s yesterday’s post, today’s post or tomorrow’s post… because they probably won’t see all three unless they’re already highly engaged with your page. However you can’t share any old photo or post and call it a day. Your content needs to be strategic. 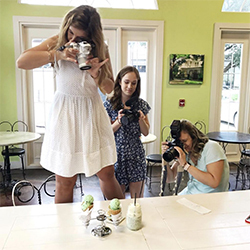 You must have a consistent voice and brand, as well as consistent photo styles in order to build a feed that people will want to follow. Constantly changing up your style online is a sure fire way to confuse your followers. On top of that, mixing up your messaging is crucial. If you post salesy sounding posts like “book an appointment” and “come see us for this service” all the time, people are going to get sick of it and guess what? They’ll unfollow. Instead, you have to build a strategy where you mix up call to action posts, informative posts, fun, more lighthearted posts, behind the scenes photos, etc. Take your followers on a ride instead of boring them or selling to them all the time. If you need content that will make building an online presence a breeze? We can help with that! We specialize in show-stopping content that disrupts the norm on social media. Would you rather be “just another dental practice” or would you rather be the practice that gets people EXCITED about dental care? We can help get you there! When it comes to online marketing, emails often are an afterthought. Sure they’re not as fun as Snapchat or as robust as a landing page or even most blog posts, but they do have a lot of value. However, sitting down to write emails to each of your clients one-by-one is unrealistic. That’s why having a good stash of email templates for dentists is a game-changer. Email templates allow you to quickly hit the “send” button without spending too much time customizing your message each time. Just save these templates in a place where you can easily copy and paste, and then all you have to do is fill in the placeholders with the relevant information! The most basic email you can send is the six month cleaning reminder. You might already have a system that automatically emails patients in your system when it’s approaching six months since their last cleaning. If so, that’s great! If not, create a template that your office staff can use to email patients their reminder. Bonus points if you make this email a little more fun and playful than the usual boring reminder email they’re used to getting! Similar to the cleaning reminder, this email template is a great tool to encourage patients to come in and start their treatment plan. This is perfect for patients that have come in and discussed services such as crowns, implants, Invisalign, etc. A lot of times, our patients will put off these services because they’re not looking forward to the appointment, so a little nudge can be really effective at getting them to book that appointment. Include a button right in the email to your online scheduler, or if you don’t have that, make sure your phone number is front and center so it’s super easy for them. This is our absolute favorite email template for dentists. Many of our patients end the year with some unused health benefits and we all know, if you don’t use ‘em, you lose ‘em. Send your patients a reminder email a few months before the end of the year to remind them to make the most of their benefits. Remind them of your services or any specials you have going on and encourage them to call for an appointment. This can be a great way to fill up your calendar and keep your patients happy! 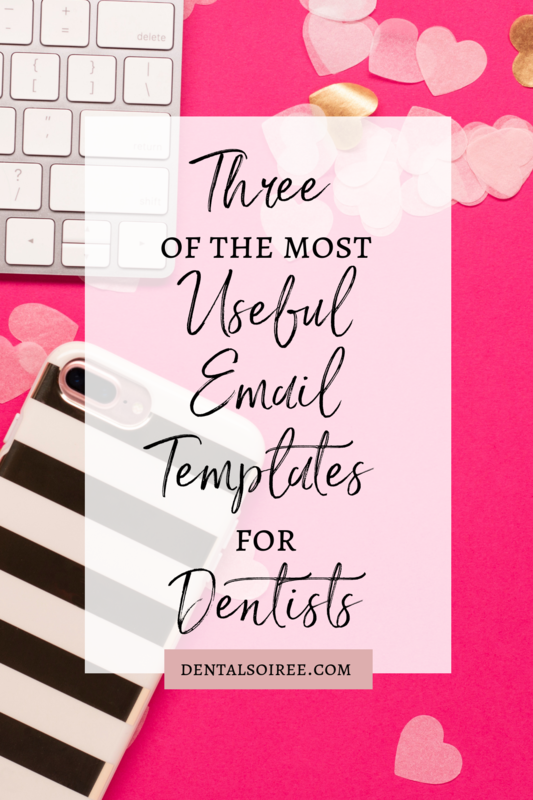 Email templates for dentists can be a game-changer, not only for getting patients through your doors, but also for your marketing budget! It costs almost nothing to send an email, and if you have these templates saved and available for your staff, it takes very little time to execute. Be sure to watch our Instagram page because we’ll be doing an email challenge in the coming weeks and it will be a great way for you to get acquainted (or re-acquainted) with the incredible power of email marketing! 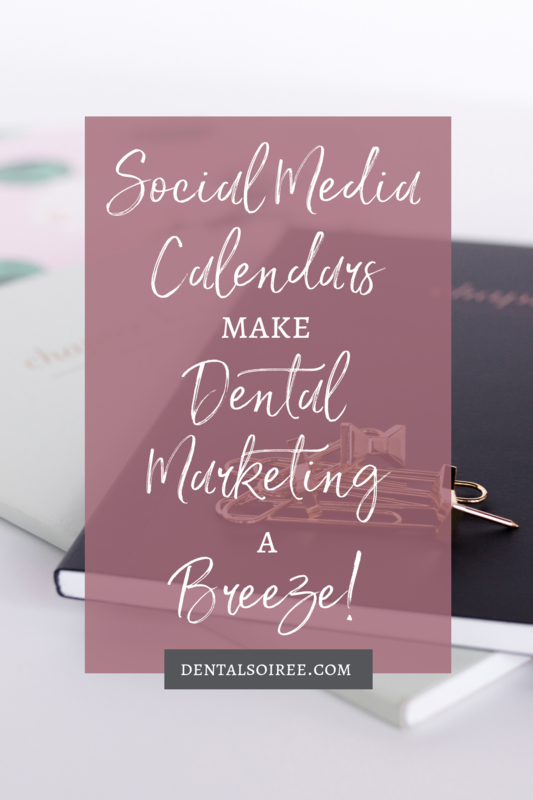 A Social Media Calendar Makes Dental Marketing a Breeze! If you want to grow your dental practice, social media is a great (and generally free) way to do it. However, with more social media platforms than ever before, it can be overwhelming to know where to spend your precious energy. That’s why we strongly suggest creating a social media calendar. What is a social media calendar? It’s simply a document that helps you organize your strategy and plan for special occasions so you can coordinate your posts. This document can be “old school” paper and pen or it can be digital. It just needs to be easy to understand, update, and share with the people who are helping you manage your social feeds. Social media can often get placed on the back burner when things get busy, but you don’t want to forget about it! I don’t know about you, but calendars help keep us accountable. By having everything laid out on one calendar or spreadsheet, it makes the tasks seem more manageable. If things get really busy, you can even use an automatic posting service to do the posting for you! By planning everything out on a calendar in advance, you’re more likely to post consistently on all your profiles. Because everything is organized and ready, it makes it easy to post regularly. With social media, consistency is everything. If you’re posting consistently, you will stay in front of your audience even attract new followers. Remember, those followers can turn into customers! Setting aside some time to organize your entire social media calendar can save you time in the long run. It may take a little bit to get it up and running, but it will leave you feeling prepared and less stressed when it comes time to start posting. Now you’ll no longer try to frantically throw together social posts at the last minute! Also, if you’re not the only one working on your business’ social media, a calendar can be a great way to share ideas and work with your colleagues. We all get stuck in a rut from time to time. If your calendar is available for others to work on, you can have some assistance with ideas, which will free you up to do the other things that are on your to do list!